During an attempt to rescue Jacob Carter, SG-1 and Martouf have been captured by Apophis on the hellish moon Netu. 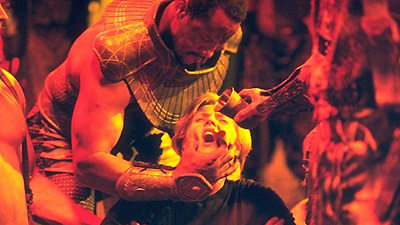 Apophis needs information to overthrow Sokar, and to get it he uses technology and the hallucinogenic "Blood of Sokar" to force each of the team to relive painful memories. Meanwhile, the Tok'ra insist that Netu must be destroyed. In an explosive battle, both Netu and Sokar's ship are annihilated, but with seconds to spare, SG-1, Jacob, and Martouf are transported to safety. Unknown to them, Apophis, too, makes an escape, and is now left in control of Sokar's massive forces. Kintac becomes the new First Prime to Apophis on Netu. The "Blood of Sokar" is a powerful narcotic that can cause very realistic hallucinations. There are no weapons capable of penetrating the shields of a Goa'uld mother ship. Aldwin's orders from the Tok'ra High Council are to launch a weapon at the core of Netu, causing a chain reaction within 12 minutes that will destroy Netu as well as Sokar's ship in orbit. Entac is a primitive world, recently conquered by Sokar, which Martouf described as a base of Tok'ra resistance in his lie to Apophis. Carter's mother died when she was a teenager. Jacob was supposed to pick her up, but when he was late, she took a cab and was in an accident. Carter's brother blamed Jacob, leading to their estrangement. Jack had never allowed his son Charlie to play with guns. Two weeks after a disagreement about a water gun, Charlie accidentally shot and killed himself with Jack's gun. Peter DeLuise cameo: the voice calling "Sokar is attacking!"